WorldClassRoom FAQs - How do I change my password for WorldClassRoom? Your WorldClassRoom password is your Office365 password. If you wish to change your password, you can do so by accessing the Connections login screen. In order to complete the following steps, you must first know your Office365 username and your current password. If you do not know your username, please see the tutorial titled What is my username? to learn how to retrieve your username. If you do not know your password, please see the tutorial titled What is my password? and utilize the information there to reset your password. 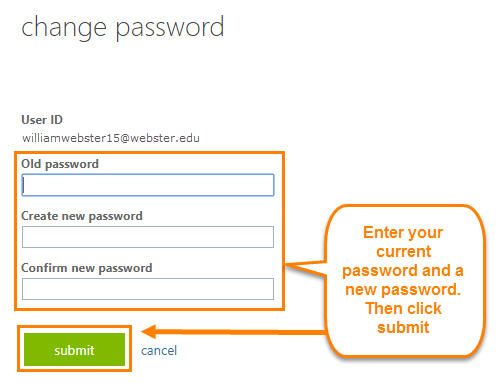 To change your Office365 password, please follow these steps. 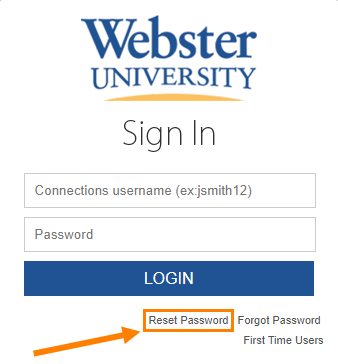 On the Connections login screen, just below the box where you enter your login information, click the Reset Password link. On the options that appear, select Change password and sign into Office365. Enter your Old Password and a New Password. Click the Submit button to save your new password.